Providing you the best range of Truck Weigh in Motion such as Weigh in Motion, In Motion Truck Weigh and Toll Weighing System with effective & timely delivery. ß 1. It mainly used in the high way measurement toll system and overloading pre inspection to inspect the wheel weight, axle weight, total weight of the vehicle passed. It gives scientific weight information to the background system. ß 2. 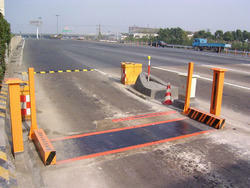 The inaccurate weighing application like Port, Mine, Bridge etc. ß The elastomer adopts high strengh alloy steel and with special treatment. ß Heat treatment technology makes it higher overload strength and fatigue limit. ß Overload ability can reach to 150%, fatigue life more than 20million times. ß The main electric parts adopts there layers PU and RTV sealed. It can long time work under rain; the surface complete treated by high temperature vulcanized rubber seal technology treatment. It have functions including rust proof, oil proof, water proof, dust proof, wear proof etc. It achieves complete isolation between metal elastomer and electric components and isolation and stable work environment of the load cell. The protection class can reach to IP68. ß Load cell thickness is 26mm which installed in the steel frame. 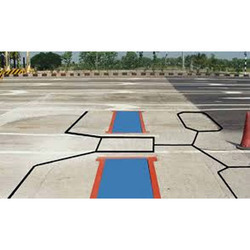 You can cut the shallow slot on the road and install the frame directly in the road. No large working is required. Trucks with axle load higher than legal limits cause a disproportionately higher percentage of damage to the infrastructure and adverse impact on traffic safety. 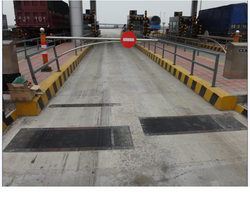 Aditya Technologies Truck Weigh in motion System is a robust, reliable, maintenance-free weighing mechanism designed for use on highway & Mines. . When speed is critical and vehicle weighing is an integral part of the operation, our system provides significant cost savings over full-platform and axle scales. The vehicle loads (wheel, axle, GVW, load ratios) are automatically analyzed, compared to legal limits and results are displayed on operator’s PC monitor, the driver gets the corresponding printout and the data are also recorded for further reporting or can be sent via LAN or Internet to the server.. This minimizes operator’s mistakes, offers inbuilt data protection and allows vehicle throughput up to 180 vehicles per hour. · Data records can be stored for future use or can be sent via LAN or Internet to the server. Looking for Weigh In Motion System ?